Lakshmi of Veggie Cuisine who runs the wonderful RCI – Regional Cuisines of India food event is our guest poster today. RCI is a food blog event that celebrates the rich and diverse regional cuisines of India. Visit the regional cuisine round ups which are treasure houses of recipes from different part of the country to learn about our rich culinary heritage. A plate of steaming hot idlis served with sambar and chutney on the side is what comes to mind the moment you think of a Tamil tiffin. While idlis are the most commonly available Tamil tiffin, the spread includes a whole lot of other varieties of tiffins and accompaniments. Step into any South Indian restaurant and you will find a whole array of popular Tamil tiffins like idly, dosa, vada, pongal, rava idli, uthappam, rava dosa, etc. 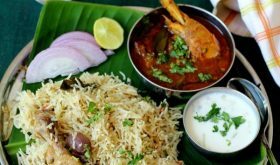 What you will not find on restaurant menus are traditional home made recipes like upma kozhakattai, sevai, aapam, kuzhi paniyaram, adai, idiyappam (also a Kerala delicacy) etc. Restaurants apart, mobile vendors (also called ‘Kayendhi Bhavan’) whip up delicious and fresh tiffins right out of their carts. As a kid, I remember eating at these Kayendhi Bhavans whenever we embarked on a long road trip. It was like a ritual in our family. Breakfast is not the only meal where tiffins are consumed. 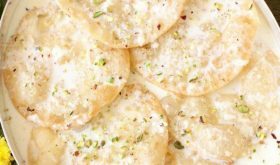 They are also a great alternative when you need a light evening snack. Some of the recipes have even found their way to the dinner table. For instance, Pongal accompanied by Gothsu makes for a wholesome and nutritious dinner. Whatever be your choice, Tamil tiffins are sure to please your palette. Accompaniments are an integral part of any traditional tamil tiffin menu. Sambar and chutney goes with idli, vada and dosa. 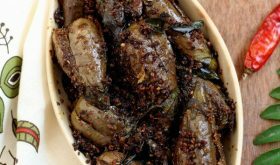 Kurma is usually served with aapam and sevai while adai can be eaten with a simple tomato pickle or lime pickle. The most popular chutney made in Tamil households is the coconut chutney which has freshly grated coconut, chutney dal and fresh green chillies. Pair it up with idli and dosa and your taste buds will be thanking you. I love to try out recipes from various cuisines and accompaniments are no exception. Sometimes I make a Chettinad tomato chutney or a peanut chutney from Andhra cuisine to go with idlis, dosas or even adai. I also make chutneys with vegetables like tindora, zucchini, ridge gourd, etc. as a healthy alternative. Tamil tiffins are very versatile even if you are on a low carb or low fat diet. Try substituting cracked wheat instead of rice while making pongal. For upma kozhakattai use gritts instead of rice. 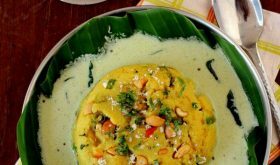 I recently came upon a recipe for adai with gritts. The vegetable chutneys I mentioned earlier are a great substitute to the traditional coconut chutney. The options are unlimited. 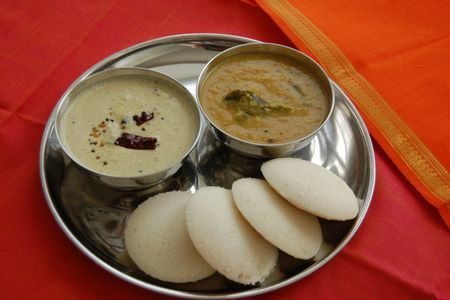 A write up on Traditional Tamil Tiffins is incomplete without a recipe for the traditional idli, sambar and chutney. Here it goes. 1. Soak the rice and dal in separate bowls for about 3-4 hours. 2. Add the methi seeds either to the dal or rice while soaking. 3. Grind the dal to a smooth consistency. 4. Do not grind the rice into a very smooth paste. Make it a bit coarse. The idlis and dosas will turn out better. 5. Add salt and to the above batter and let ferment overnight or until you see the batter rise up. 6. Pour into idli moulds. Steam 10-12 minutes and serve hot with chutney and sambar. Add water and dilute the batter to make dosas. 1. Put the ingredients in a blender and make a paste. 2. Season with mustard, urad dal, curry leaves and dry red chilli. 4. For a thinner consistency add more water while grinding. 1. Cook thuvar dal and set aside. 2. Pour oil in a pan and slightly fry the onions until they become soft. Do not burn them. 3. Add the tamarind extract, tomatoes and turmeric powder and boil until the raw smell of the tamarind disappears. The tomatoes will get cooked in this process. 4. Fry the ingredients for the paste with very little oil. Make a paste and add to the tamarind mixture. 5. Let it come together then add the cooked and slightly mashed thuvar dal. 6. Add salt and water if required. Mix well. 7. Season with mustard seeds, urad dal and curry leaves. Sambar can also be made with vegetables like bell peppers, bottle gourd, butternut squash, etc. For idlis onion sambar is the best. The next recipe is for sevai and kurma. A light snack would be served whenever a groom came to see a prospective bride. 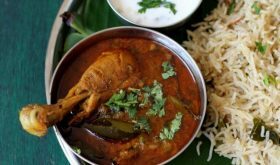 And sevai was the most popular and a must-have item on the menu for this occasion. While making sevai from scratch is a laborious process, everyone in the house would pitch in to make this light and fluffy delicacy. Sevai is usually served with potato masala and coconut chutney. Kurma as an accompaniment to sevai offers an interesting twist to this traditional recipe. 1. Put a big pot of water to boil. Once the water boils add the instant rice vermicelli. Keep stirring and remove as soon as it is cooked. This takes hardly 3 to 4 minutes. Do not overcook as it will become sticky and lumpy. Drain and spread out on a plate to cool. Add 1 to 2 tsps of oil to prevent the vermicelli from sticking. 2. Pour oil in a pan and add the mustard. Once it splutters add urad dal, channa dal, green chillies and curry leaves. 3. Add the turmeric powder and asafoetida mix well and remove from the flame. 4. Transfer the rice vermicelli to the pan with seasonings and mix well. It is easier to handle the vermicelli with your hands. Keep loosening the vermicelli as you mix into the seasoning. 5. Add salt, lemon juice and cilantro and mix till all are incorporated. 6. Garnish with roasted cashews. 1. Cook/steam the vegetables and set aside. I use a microwave steamer. You can also use a pressure cooker. 2. Make a paste of the ingredients above. 3. Pour oil in a pan and add bay leaf and onions. 4. Saute until onions are soft and add green chillies and ginger garlic paste and mix well. 5. Next add the red chilli powder, Kashmiri chilli powder, coriander and garam masala powder and sautÃ© till blended with the onions. 6. Add the masala paste, tomato and tomato paste and cook till the oil leaves the sides of the pan. 7. Add water to make the gravy thinner. 8. Drain the water from the steamed vegetables and add to the gravy. 9. Add salt to taste and garnish with fresh chopped cilantro. Thank you Sailaja for giving me an opportunity to write a guest post on your blog. I really appreciate your effort in trying to bring to light the Indian traditional recipes and cooking ideas from home kitchens across the world. I hope the readers will enjoy reading this write up on Traditional Tamil Tiffins. I love idlies and i would love to have that first plate with idlies and that sambar and chutney. I really wish i could just grab that plate from the screen and eat them. wow lovely and mouthwatering spread. Idli looks yummm but semia with kurma looks very tempting and drooling..
Lovely recipes.. pictures are superb!!! Can I use normal rice if I dont have ponni boiled rice for the idlis ? How to make soft and white idlis ? Thanks for all the wonderful receipes. I simply love them. love the sevai and kurma! I’d do anything to have these plates of delicious breakfasts every day in the morning! hum, feel like running back to india! One doubt Sailu garu instant vermicelli means the one we use for semiya payasam or is it different…could u plz tell me? After a long break you reminded me about the thuvar dal sambar. It is an excellent combination for idlis and doshas. But it is impossible to prepare in the morning busy times. So i forgot it. Thank you Sailu n Lakshmi. When I make sambar, I have made it in the style you mention for VARUTHU ARAICHA SAMBAR, but never heard that term. What does Varuthu Araicha mean? Also for sevai, is there any other accompaniment beside korma? Thanks. VARUTHU ARAICHA SAMBAR means fried and ground sambar. For sevai you could have coconut chutney as well. It tastes excellent. Sailu your website and the recipes are great. I am going to try your recipes. Thanks. Lakshmi, I am from Tamil Nadu too, but live in US right now. Quick question, the sevai from Asian store has Gluten in it and comes out rubbery when made. Any tip on that? I’ve been an onlooker who happily gorged on your recipes, Sailu. You are too good to be true! And thank you for bringing on gems like Lakshmi. Her recipes are great, especially the sevai which is different. Keep up the good work, Sailu, and we all appreciate your generosity in sharing it, I’m sure everyone out there agrees! Love idlis But the LOVE the sevai even more. looks so delicate & so ready to eat. Very nice article. I loved the recipes & photos too. Great job!! very awesome recipes, even i regularly prepare rice sevai upma. it is one of my all time favourites. The idlis will come out white, soft and fluffy if you use ponni boiled rice. If you want to use normal rice then the recipe will change. You will have to follow a trial and error procedure to arrive at the right combination to make soft idlis. I suggest you use ponni boiled rice. 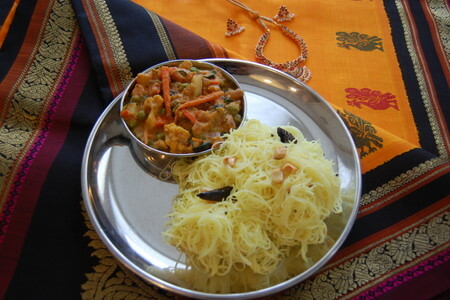 The sevai recipe uses instant rice noodles not vermicelli. You will find them in Asian stores and Indian stores. Some of them are branded as instant rice noodles and sometimes as instant rice vermicelli. But both are the same. Do ensure they are made out of rice. ‘Varuthu Araichu’ means ‘roast and grind’. Because in this recipe for sambar we roast the spices and then grind them. As I mentioned in the post, Sevai is traditionally accompanied by potato masala. The kurma was just a twist on the traditional recipe. Avial (a medley of vegetables in coconut gravy) is also a good accompaniment. i tried idlis with ponni rice and urad dal 4:1 ratio.i left overnight for fermentation but the next morning the idlis turned hard.please tell me where i went wrong. thanks for the samber/chuteney info, I can make for my weekly doshas. Lakshmiji, please include how you SAY IT. One more thing, some of my south indian friends say its tosai and some say dosai – I say doshas. Who’s right? Helppppppp! Lakshmi,you have done a marvelous job!!! !.All the items look delicious.Do you try Iddlies with UncleBen’s rice?kEEP UP THE GREAT WORK!!!! can u tell how to prepare idly poodies?